Defendants slam ‘vicious immigration system’ as disputed charter flight deportation continues to Jamaica. Image: Some of the "Stansted 15" outside Chelmsford Crown Court in Essex, ahead of sentencing, 6th February 2019. Credit: John Stillwell/PA Images, all rights reserved. All 15 of the anti-deportation protesters who blocked a government-chartered deportation flight in 2017 are likely to avoid immediate prison sentences. The judge has indicated that three will be given suspended sentences and 12 community service. The news that they would not face prison was met with loud cheers from the hundreds of people gathered for a solidarity demonstration outside the court. On the night of 28 March 2017, in a corner of Stansted Airport they locked themselves on the runway around a Titan Airways Boeing 767 plane due to deport around 50 people to Nigeria and Ghana. Using arm tubes and tripods, they stayed there for over eight hours, stopping it from taking off. After a grueling trial which ran from 1 October until 10 December 2018, 15 members of the campaign group End Deportations were found guilty by a jury of “intentional disruption of services at an aerodrome”. The conviction, under the 1990 Aviation and Maritime Security Act – a law passed in response to the 1988 Lockerbie bombing – centred around the apparent danger posed by the Stansted 15. But, it was the need to prevent danger that led to their actions that night. The 15 are appealing their conviction and have called for their terror convictions to be quashed and hostile environment dismantled. In a statement, the Stansted 15 said: “The convictions will drastically limit our ability to work, travel and take part in everyday life. Yet, people seeking asylum in this country face worse than this: they are placed in destitution and their lives in limbo, by the Home Office’s vicious system every single day. When they ran onto the runway, wearing pink hats, carrying banners and chanting, it was because they knew that the safety of several people who were on the plane would be under threat if the deportation was successful. They knew that the ex-husband of one woman on board had said he would be waiting for her when she arrived, and that he was planning to kill her. She had tried to claim asylum in the UK because of her sexuality, but had spent the last six months imprisoned in Yarl’s Wood detention centre. Many of the Stansted 15 had been involved in working for migrant rights, or had known people who had been deported or otherwise suffered at the hands of the border system. They had all heard or read testimonies from people in detention. Through their own varied experiences and research, they also knew that the people on the plane were at risk of violence from security guards, as well as likely to be subject to verbal abuse. Each had taken measures – such as wearing hi-visibility jackets – to ensure that they reduced danger, not caused it. Protests, petitions, strongly worded letters, calls to the police, the Home Office and airlines, were just some of the campaign tools that the 15 had tried to stop previous charter and commercial deportation flights from taking place, but none had worked. But, in summing up towards the end of the trial, Judge Christopher Morgan told them that they could not rely on a defence of acting to prevent human rights abuses. He also told the jury that they must disregard any evidence given that supported a defence under “duress of circumstances”. Eleven of the people on the halted March 2017 flight are still in the UK and have been able to keep fighting their cases. The Stansted 15 have been described as ‘heroes’ by one of those people, a man who has lived in the UK for over a decade. As he sat on the flight, waiting for it to leave, his mother and two children were also in Britain, as well as his pregnant partner. The delay to the flight meant that he was able to successfully appeal against his deportation and be at his partner’s side while she gave birth to their daughter. I attended court several times throughout the trial and witnessed the defendants speaking powerfully about their motivations and why they took action. I was immensely proud of my friend, Emma Hughes, as I watched her give evidence while eight months pregnant. She summed up why she was there that night: “I did it because people’s lives were in danger if that flight had left – I knew it was going to be safe”. While many people would be reading parenting books and tying up loose ends at work, she was spending every day sat in a court room, facing the prospect of giving birth in jail and being separated from her new baby and family at the very time they needed to be together. Emma gave birth to her son just after Christmas – less than three weeks after the end of the trial. For one of those convicted, 30-year-old Alistair Tamlit, it has been hearing about the impact of the action, particularly on the people who are still in the country two years later, that has helped him keep going. The high-profile nature of the Stansted 15 case has helped bring the practice into the spotlight again. Since the 2017 action, chartered deportation flights have started to leave from smaller airports such as Biggin Hill in South London, and from military bases like RAF Brize Norton in Oxfordshire. Stansted airport has reportedly banned the Home Office from using its runway for deportation flights due to the high risk of direct action against them. As the Stansted 15 arrived at Chelmsford Crown Court, to a solidarity demonstration of around 400 people, a chartered deportation flight carrying around 35 people took off for Jamaica from Birmingham Airport. It is thought to be the first chartered deportation flight to Jamaica since the Windrush scandal. The terror related conviction of the Stansted 15, along with the imprisonment and subsequent release on appeal of the Frack Free Four – found guilty last September of Public Nuisance after occupying lorries delivering drilling equipment to the Preston New Road fracking site – has raised significant concerns about the erosion of the right to protest in the UK. Amnesty International UK Director Kate Allen said: “The decision not to jail these brave human rights defenders is a relief, but not enough. They should never have faced this very serious terrorism-related charge in the first place. “They remain convicted of an offence which simply doesn’t fit their actions and their trial could have a dangerous chilling effect on peaceful protest in this country. On Tuesday, human rights organisation Liberty wrote to the judge to urge him to consider proportionality in sentencing. Liberty’s acting director, Corey Stoughton said: “The excessive charges brought in this case were an attack on the right to protest that threatens activists, campaigners and anyone who cares about the need for dissent. The Stansted 15 case is the first time this terror related charge has been used against peaceful protesters. In fact, they were originally charged with aggravated trespass, a much lesser charge that would have been dealt with in a Magistrates court and which carries a much smaller potential prison sentence. This charge was suddenly changed a few months after they were arrested, at the request of the Crown Prosecution Service. Lead defence lawyer in the case, Raj Chada, has said that this is the first time in his 20 year career as a lawyer that he has experienced a charge being changed from one carrying a maximum sentence of a few months in prison, to a potential life sentence. 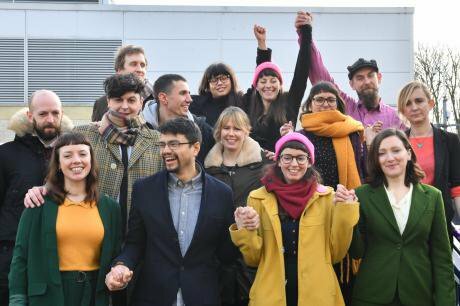 Meanwhile, the Stansted 15 faced a real threat of being sent to prison today, particularly Alistair Tamlit, Mel Strickland and Edward Thacker, who were previously convicted of aggravated trespass for an environmental protest at Heathrow airport. I spoke to Tamlit five days before the sentencing as he was made preparations to go to prison – speaking to people who had been incarcerated, reading what he could about what it would be like. He told me that he has been “trying to demystify” the prison experience but was feeling anxious about the prospect. Charter flights are a secretive and efficient way to remove a planeload of people from our communities, often tearing families apart by deporting loved ones who have been in the UK for decades. They are just one sinister aspect of Britain’s growing border industrial complex – an excellent example of how state violence and corporate power collude to take away people’s liberty, and too often their lives. Any further restrictions to freedom of movement and migrants’ rights after Brexit can only bolster this system and line the pockets of the corporate interests involved, including airlines and private security companies. In 2017 the UK deported more than 12,000 people, including people whose asylum claim had been refused. While most deportations happen on commercial passenger flights, up to 2,000 people a year are removed on flights chartered by the government, like the one stopped by the Stansted 15. People are often shackled in “waist restraint belts” or “leg restraints” and escorted by private security guards. Many people are deported before they are able to pursue all legal avenues to remaining in Britain, or while their case is still being decided. In 2017, 42 charter deportation flights removed 1,664 people – with the top three destinations being Albania, Pakistan and Nigeria/Ghana. Flights have also removed people to Kosovo, Romania, Czech Republic and Jamaica. These are countries where the UK has been able to make a deal with each respective government, often as part of wider trade and ‘aid’ negotiations. The danger for those being deported is not only waiting for them when they land. The violence experienced during the deportation process has also been well documented, such as the death of Jimmy Mubenga, who died while being restrained by G4S ‘escorts’ on board a commercial British Airways flight to Angola from London Heathrow in 2010. The Independent Monitoring Board for charter flight deportations have expressed concern about the continued excessive use of restraints, the long periods of detention on coaches, and people being denied dignity and privacy whilst using toilet facilities. On a June 2017 Dublin flight, everyone being sent to Germany was put in restraints from the start, regardless of individual risk assessments. One example was documented in the Board’s annual report: “A young woman did not want to go. She refused to stand up and leave the coach to board the aircraft. She was cuffed to get her off the coach. She stood on the tarmac weeping. She was asked whether she was willing to walk and allowed a matter of seconds in which to decide. She did not appear to make a decision. Despite the weighty conviction of the Stansted 15, there is a growing campaign against airlines that carry out deportations. In January, activists from Lesbians and Gays Support the Migrants (LGSMigrants) crashed a gala event hosted by Airlines UK at the Park Plaza Hotel in London, handing out sick bags which read “deportation contracts make us sick” and storming the stage with a banner. Guests included government aviation minister Baroness Liz Sugg and British Airways CEO Alex Cruz. In December, they replaced London Tube adverts with posters encouraging people to stop deportations. Activists also took action against British Airways last summer when they locked themselves inside the i360 – an observation tower attraction on Brighton seafront sponsored by the airline. The action took place during the annual Pride celebrations, which was also sponsored by British Airways.